Keeping up with Landree: Happy Valentine's Day! Landree had a Valentine Party at school yesterday. 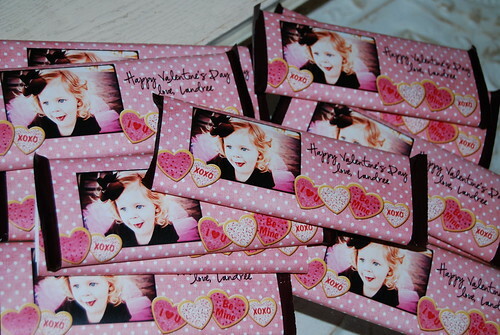 Here are the little Valentine's we sent to her school friends. When I told her she was going to have a party at school she started singing 'Happy Birthday'. This girl loves a party! OMG-if they are not the cutest valentines!! She is so darn cute!!! Happy Valentines Day!!!! OH MY WORD!!!!!!!!!!! 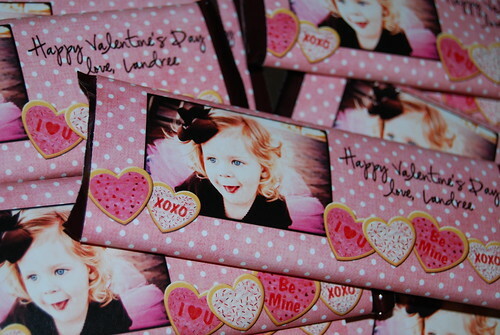 These have to be the cutest Valentines I have ever seen! So sweet:) did you make them? How sweet are those? Yummy! She is so beautiful and you are just getting too good at this photography stuff! These are darling! You amaze me. Your photography is great, and once again thanks for leaving me feedback! I get so excited...Would you do a class on digital scraping/blog design, etc????? I would go to your workshop!!!!! THose are the cutest valentine's I have seen yet!! Have a Happy Valentine's Day!! Oh my goodness! These are soooo cute! I wish I had your creative bone! How did you make them?! You knew we would ask! Love how the candy bars turned out!!! Everyone loves a party!!! Happy Hearts Day.